One of the best ways to get into curing meats is to do a bresaola, air-cured loin of some sort of red meat. Thinly sliced, it is a magnificent piece of charcuterie, deep red, light on the tongue and very meaty. 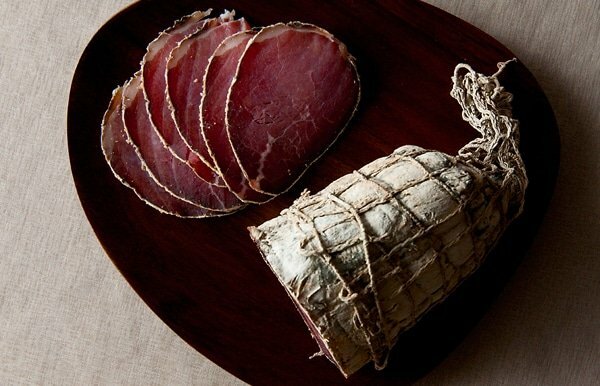 Bresaola is the easiest charcuterie project you can make, other than bacon. It’s is nothing more than lean meat, salted and air-dried. It is a Northern Italian creation, but many, many other cultures have something similar: The Spaniards have their lomo, the Armenians have pastirma, the Greeks call it apokti and the Swiss bindenfleisch. 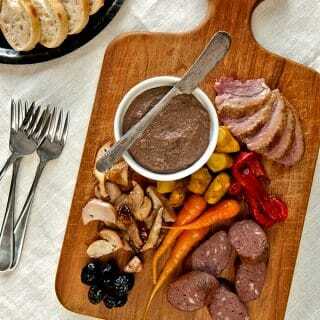 In some cases the meat is beef, others pork, and in a few instances large wild game is used. It is always a solid muscle, usually the eye round, which is a sort of false tenderloin that hides within the back legs of four-footed creatures. But a length of loin or backstrap works just as well. For these photos, I chose to go with bison eye round. No, I did not go out and shoot a buffalo and not tell you about it. I actually ordered it from Whole Foods. Beef eye round works well, and although I could have used some venison backstrap, I did not want to part with it for charcuterie. I don’t kill many deer a year, so backstrap is precious. In a nutshell, all you need to do is salt the meat down and then hang it in a cool place until it is as firm as you want it. 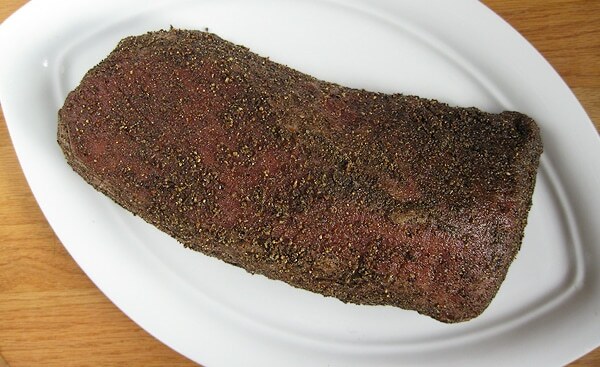 An Italian bresaola is coated in spices, however. So are pastirma and apokti. The only hard part of it all is keeping humidity even and high for the weeks or months you’re hanging this puppy. It is essential to keep the humidity above 70 percent. I start mine at 85 to 90 percent for a few days, then ratchet it down 5 percent a week until it gets to 70 percent, then I hold it there for a month. After that I ratchet it down to 60 percent, where it can stay indefinitely. If your humidity goes too low, you risk what’s called “case hardening,” which is when the outside dries and hardens faster than the inside. This can be anything from unsightly to dangerous. In the case of the batch in the photos, it was pretty mild: The outside of the meat is a little darker than the center, but it is all cured and nice. In bad cases, the outside can harden so much the inside can no longer lose its moisture — and then the meat rots from the center. Tragedy. 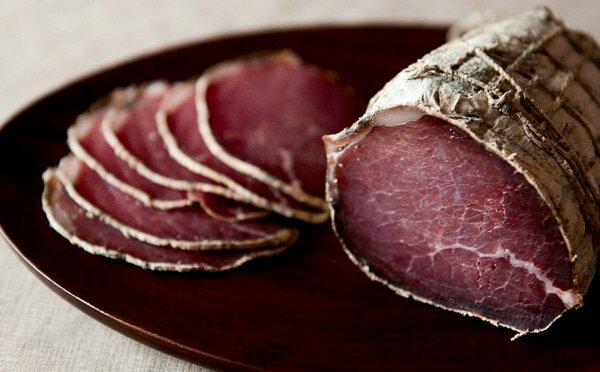 I cured my bresaola for three months. At the end of that time, the outside was covered in white mold, with a little green here and there. It had a funky-yet-sweet aroma and tasted superb. The long hang time is the difference. You can make a decent bresaola in as little as a month, but the longer you can take it, the mellower the salt and spices will become, and the funkier it will get; and I mean that in a good way. How do you eat it? I slice it as thin as I can (a meat slicer is best if you have access to one) and eat it as-is. But you can drizzle some olive oil and lemon juice over it, throw some arugula on top and grind a little black pepper over it all. That’s how the Italians do it. I rarely do anything more than stand there and eat it at the counter. Quality of meat is vital here. Use only the best meat you can find, as it is the star here and nothing can hide crappy, factory-farmed meat. Grass-fed beef or bison is best, and moose or elk are also ideal. Mutton would work, as would a length of venison backstrap at least 18 inches long. If you are using pork, see my recipe for lonzino instead. Remember the thicker the meat, the longer the cure — and the harder to keep that humidity even. If you are just starting out with charcuterie, go for an eye round or loin piece no wider than 2 inches. Makes 1 bresaola, about 2 1/2 pounds. NOTE: If you have a 3-pound piece of meat, you can leave the spices the same. But you will need to decrease the amount of salt, sugar and curing salt. For a 3-pound piece of meat, you will need 25 grams of kosher salt, 30 grams of sugar and 4 grams of Instacure No. 2. Make sure your meat has most of the fat and all of the sinew removed. Bresaola is supposed to be lean. Trim the ends to make a nice cylinder. Mix all the spices together and massage them into the meat so it is well coated. Save any excess spices. Put the meat and the excess spices into a plastic or other non-reactive container and put in the refrigerator. Cure this for 12 days, turning the meat over once a day. Pour off any liquid that accumulates, and redistribute the spices as needed. 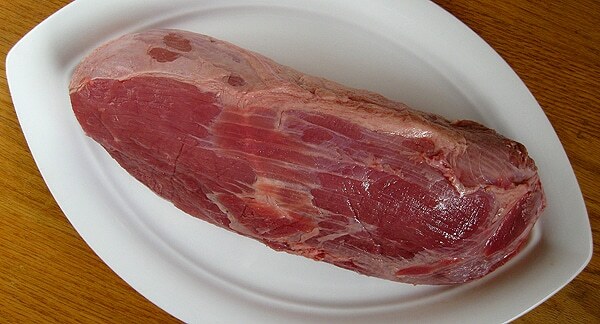 If the meat is 2 inches wide or less, cure for only 6 to 10 days. The meat is ready when it feels firm. Rinse off the spices under cold water and pat dry with paper towels. It’s OK if some spices stay stuck to the meat. You just don’t want them all there for a bresaola. In pastirma and apokti, new ground spices are added at this step, so if you want to, you can add another round of spices — just leave out the salt, curing salt and sugar. Truss the meat, or fit into a sausage netting; you can buy these online through Butcher & Packer. Hang in your curing chamber. Set your humidity so it is between 85 and 90 percent for a week. Set your temperature in the curing chamber between 50°F and 55°F. Check your humidifier every couple days to make sure it has water in it. Ratchet the humidity down 5 percent each week until you get to 70 percent. Leave it there. It’s OK if it jumps higher from time to time, but under no circumstances should you let the humidity get lower than 50 percent. Your bresaola can survive a few of these humidity “accidents,” but be vigilant. Monitor mold. You actually want a layer of white mold on the bresaola: It protects the meat from nastier molds, and helps the meat to dry evenly. 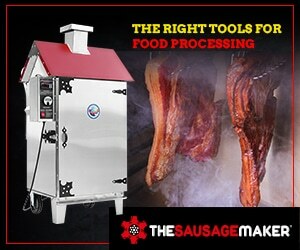 You can inoculate your bresaola with a special mold culture you can buy through The Sausage Maker. Remember: White mold is good. Green mold is not the end of the world, but wipe it away periodically with vinegar. Black mold is bad. If you get a serious growth of black mold, toss the meat. Vinegar is your friend here. Keep tabs on the bresaola and molds will not get out of hand. After at least a month and as much as 6 months, when your bresaola is firm enough, take it out of the chamber and into the fridge. It will last there indefinitely. You can also keep it in your chamber, or you can seal and freeze it. Explore the whole world of cured meats and fish, right here on Hunter Angler Gardener Cook! bresaola with previously frozen meat? Am I missing the links you reference for what you use for your curing chamber?